Bluetooth® v4.0 specification fully qualified software. 80MHz RISC MCU and 80MIPS Kalimba DSP. 16Mb internal flash memory (64-bit wide, 45ns); optional support for 64Mb of external SPI flash. Stereo codec with 2 channels of ADC and up to 6 microphone inputs (includes bias generators and digital microphone support). voice connections including wind noise reduction. 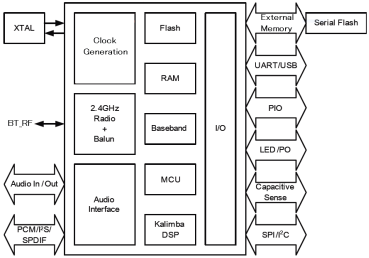 Audio interfaces: I²S, PCM and SPDIF. 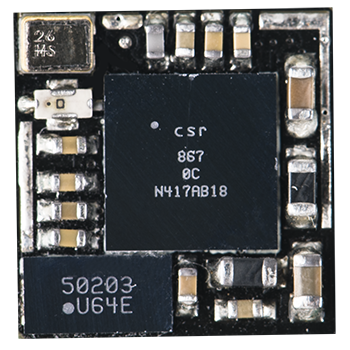 Serial interfaces: UART, USB 2.0 full-speed, I²C. Integrated dual switch-mode regulators, linear regulators and battery charger. 3 hardware LED controllers (for RGB) and ability to drive LCD segment display directly. Support for up to 6 capacitive touch sensor inputs. Surface-mount, Size: 9.00×9.00×1.80mm max pitch 57-ball BGA. K-mate® KMBT020 BGA consumer audio platform for wired and wireless applications integrates an ultra-low-power DSP and application processor with embedded flash memory, a high-performance stereo codec, a power management subsystem, LED and LCD drivers and capacitive touch sensor inputs in a SoC IC. The dual-core architecture with flash memory enables manufacturers to easily differentiate their products with new features without extending development cycles. The enhanced Kalimba DSP coprocessor with 80MIPS supports enhanced audio and DSP applications. The audio codec supports 2 ADC channels, up to 6 microphone inputs, stereo output and a variety of audio standards.